Text and Photographs ©copyright 1996 Dale T. Andersen. All Rights Reserved. Reproduced with permission. During a recent visit with our New Zealand colleagues, we had the opportunity to meet briefly with the Prime Minister of New Zealand, Rt. Hon. Jim Bolger and others in his party including Sir Edmund Hillary. 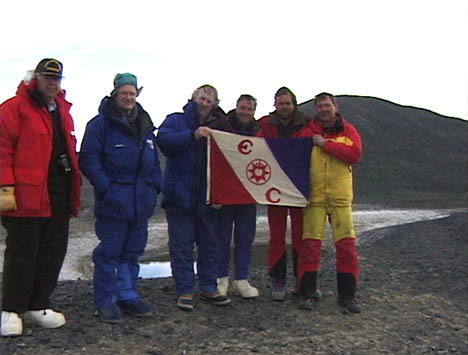 Sir Edmund is an honorary President of the Explorers Club. As luck would have it, other members of the Explorers Club just happened to be present. Shown left to right are: US Ambassador Beeman, Rt. Hon. Jim Bolger, Sir Edmund Hillary, Robert A. Wharton, Jr. (Desert Research Institute, Reno, NV), Andrew Fountain (Portland University, Portland, OR), Dale T. Andersen (SETI Institute, Mt. View, CA).